If you could travel in a Time Machine would you go back to the past or into the future? Well, I assume that going into the future would be safer, since there would more likely be the technology to refuel the time machine and send me back if things did not work out. However, I am always fascinated by historical stories. When I visit museums, I stare at the exhibits trying to imagine how every detail actually looked and felt in the long ago. I suspect it was more vibrant than books and movies depict it, so given the choice, I would go back the past (just to test my theory). If you were stranded on a desert island what 3 things would you want with you? A fully staffed cruise ship, a bathing suit, and a credit card. Barring that cheat, I would probably need a good knife, some rope, and a book about how to survive on a desert island. That would not leave me anything fun to read, but I could daydream and sing without worrying about who would hear me. Nickname? I drew a short straw in the nickname department. The most common is, wait for it, Moon. In order of frequency, I have also been called Moondoggie, Moondog, Moonie, and Moonbeam. A couple of people call me Scotty. I should consider myself lucky, because in the crew I run with, these are tame. At home my favorite is Daddy, but only four people get to call me that. If you were a superhero what would your name be? Something hard to say, like Captain Indefatigable. The super villains would have aneurysms trying to say my name during their monologue and I could hit them with a surprise attack. If you could have any superpower what would you choose? Flight. What is your favorite flavor of ice cream? Chocolate! If you could meet one person who has died who would you choose? My grandpa Jack or my grandma Ruth. I was too young to know them when they died. What is your favorite thing to eat for breakfast? Raisin Bran. Night owl, or early bird? That depends on what time my pager goes off. If no one is barricading themselves in their houses, doing drive-bys, or causing a riot, then I am generally a night owl because that is the best time to write—fewer distractions. Skittles or M&Ms? M&Ms, all the way. When I was a detective in the Exploited Missing Child Unit, the detective across the hall kept a large jar of M&Ms. Some days, I ate everything in the jar. Please tell us in one sentence only, why we should read your book. The characters are great and they get into all kinds of trouble. Any other books in the works? Goals for future projects? 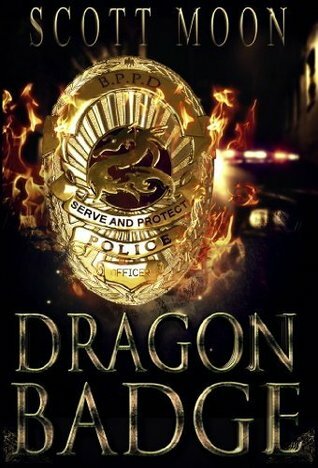 I have recently finished book two of the Dragon Badge series and have set it aside to cool before beginning revisions and edits. In the meantime I am rewriting a science fiction novel from scratch that I am excited about. When both of these projects are done I want to revisit about six of my previously completed manuscripts (urban fantasy, dystopian thrillers, and fantasy) and either shop them for an agent or self-publish. My new projects, stories that range from rough outlines to partially complete manuscripts, include all of the above genres plus something I call cowboy fantasy. This is very exciting. Last summer I started a “90,000 words in 90 days” project writing the cowboy fantasy, but quit after about 20,000 words to work on my Dragon Badge series again. What inspired you to want to become a writer? Writing was the first thing, besides snow skiing, that I felt I was really good at. As a kid I always wanted to be on the ski patrol, which was tough to do in Kansas. I remember writing a story in third grade that the teacher praised, which was cool because I daydreamed too much to excel in most subjects. When I was twelve, my mom suggested we write a book for kids my age, which we did. I think she still has it somewhere. Can you see yourself in any of your characters? I try not to. No one wants to read about me. I also take deliberate pains not to allow real people or their stories into my books. Fiction should be fiction, in my opinion. Plus, my personal experiences would be embarrassing and I am shy. Hidden talent? I can make someone not want to fight me. The trick is to “be nice” just like Patrick Swayze said in Roadhouse, while at the same time being absolutely ready to throw down. How do you react to a bad review? I cry, not literally, because that wouldn’t be manly. The process for me starts with admitting that the bad review is a punch in the gut and then rallying to write better, if the criticism has any merit. 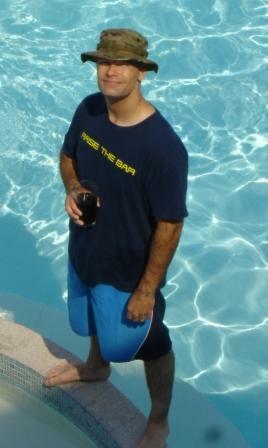 I am an introspective, self-critical person (ask my wife) and tend to assume any fault is my fault. Then, and this is the important part, I read one of my stories. It does not take long to impress myself with the raw genius and power of my narrative style. LOL. I focus on the writing, have some fun with it, and run through green meadows of nirvana. Who are your favorite authors of all time? Stephen King, Dean Koontz, Patrick O’Brian, Bernard Cornwell, George R.R. Martin, James Clavell, Elmore Leonard, Thomas Mullen, Ken Follett, J.K. Rowling, Michael Moorcock, Michael Connelly, Philip Roth, Cormac McCarthy, and I had better just stop there. I like J.K. Rowling for story and character, Stephen King for character, Elmore Leonard for pace and dialogue, Michael Connelly for depth of setting and development of Harry Bosch, and Michael Moorcock and George R.R. Martin for world building. Patrick O’Brian, Thomas Mullen, and Ken Follett blew me away with their historical fiction. Cormac McCarthy and Philip Roth inspire me with their overall power and James Clavell took me far and away. They all do everything to near perfection, but that is how it falls out for me when I really think about it. What was your favorite children’s book? Leo the Late Bloomer. What do you do in your free time? After work, family, writing, and reading I enjoy exercising, playing the guitar, watching movies, drawing, and a ridiculously long list of hobbies. Exercising should be its own sub-category, because it includes weight lifting, running and other cardio, flexibility, and martial arts—Brazilian Jiu-Jitsu and Kenpo Karate. I had a teacher in high school who did me the dubious service of convincing me I could do anything I want, so anything I see that is cool, I want to do. But mostly, I write, read, and hurt myself working out.